It’s amazing how an actual attempt in putting your mind to something can make you realize how terrible you are at focusing. I am, by no means, one who is timid in enforcing self control. But at times (blame spring and the fever that comes with it) I just find progress depressingly close to being stagnant while my mind rummages through even the least significant details dating back to over half a decade. And then I’m thinking, if I am carrying so much junk with me, how am I supposed to pick up anything new and valuable? How I wish I could just empty my mind like dumping all those second-rate photos into the recycling bin then emptying that with just a couple of clicks. I wish my mind could absorb new knowledge like downloading a (legitimate) program. But then what kind of life would that be? Isn’t life supposed to be valued by the little things that take our breath away – the smell of fresh rain on the sun-baked sidewalk, the coolness of plunging my arms elbow-deep into a sac filled with rice, the shadows of branches swaying to the breeze? Oh, please make everything new again. To clean the tofu, tip out all the liquid in the tofu container. Gently rinse the tofu under cold water. Put it in a lidded container that fits and pour cold filtered water over it until it is completely submerged. Cover and refrigerate overnight. This will give your tofu a very clean, delicate flavour without an overpowering soy taste. The next day you will notice that the water has taken on a yellowish tinge, that’s perfect. Tip out that liquid again, take out the tofu, and rinse under cold water again. Pat it dry with some kitchen towel, then wrap it with a cheese cloth on your cutting board. Leave a weighted plate on it for 15 minutes or so to help extract the moisture. This will help you get those super-thin slices as well as prevent your finished carpaccio from drowning in its own liquid. Unwrap the tofu, and using your sharpest knife, carefully slice the tofu as thin as possible. As soon as you make a slice, lay it on the plate overlapping to conform to the shape of your plate (it is nearly impossible to try and transfer each slice after accumulating them on the cutting board.) Once you’re done slicing and plating, chill it in the fridge. Meanwhile, in a small bowl, stir together the soy sauce, sugar, vinegar, and sesame oil to combine. Take out the tofu (if moisture has formed, dab it gently with more kitchen towel. 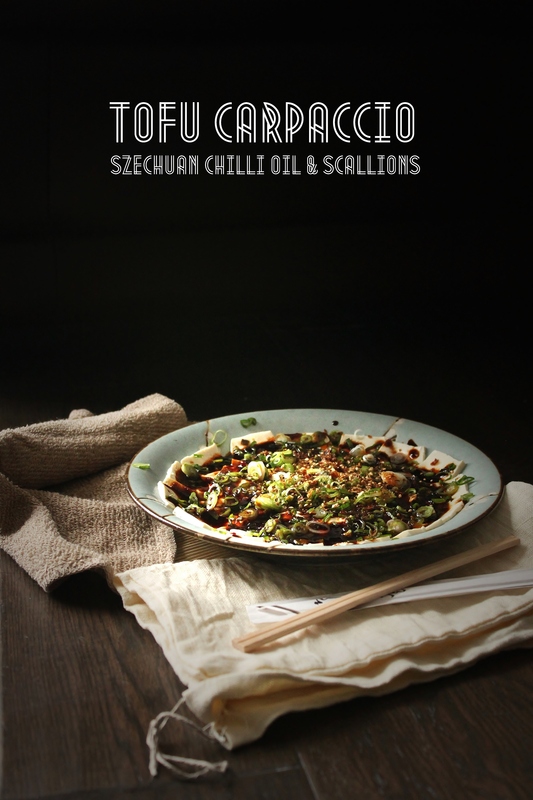 Drizzle on the sauce and chili oil. Garnish with the scallions and nori, sesame/peanuts, if using. Serve with steamed rice…you’ll need lots, but enjoy!